Coloring for Adults to reduce stress or anxiety and increase a sense of well being? That’s what this book I found at a local book store recently claims. Currently, Color Therapy books are outselling cookbooks in France. See this article in the Huffington Post. The beautiful hardcover and intricate pictures piqued my interest. Stress reduction is one of the areas I work on with my clients. Coloring therapy books are currently outselling cookbooks in France. With stress on the rise, it is becoming more and more difficult to unwind, focus and decompress. I picked up a copy and couldn’t wait to get started and give it a try! Doodling is allowed, you can choose your own medium (pencils, gels, pens), there are no rules. This book is broken down into color categories, blues, oranges, purples, reds, greens……. each color evoking different feelings and memories for the individual using the book. 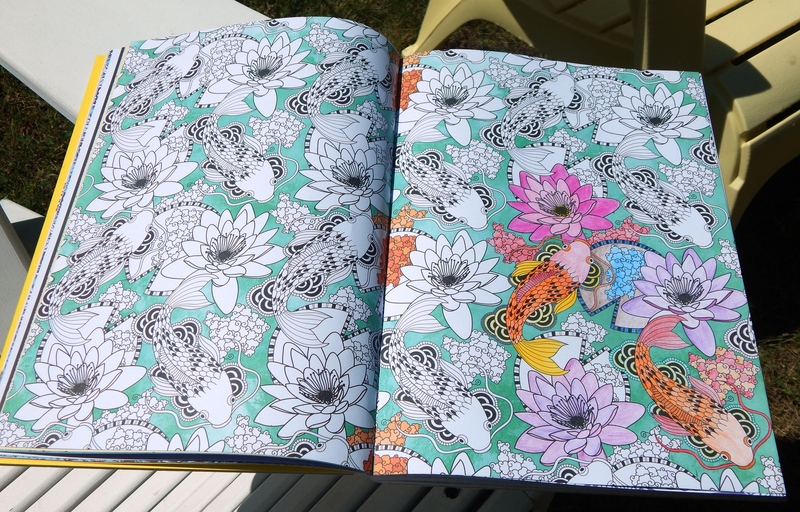 I have been using this book for a month now, and my concentration has increased, and I feel calm, peaceful and focused after a coloring session. 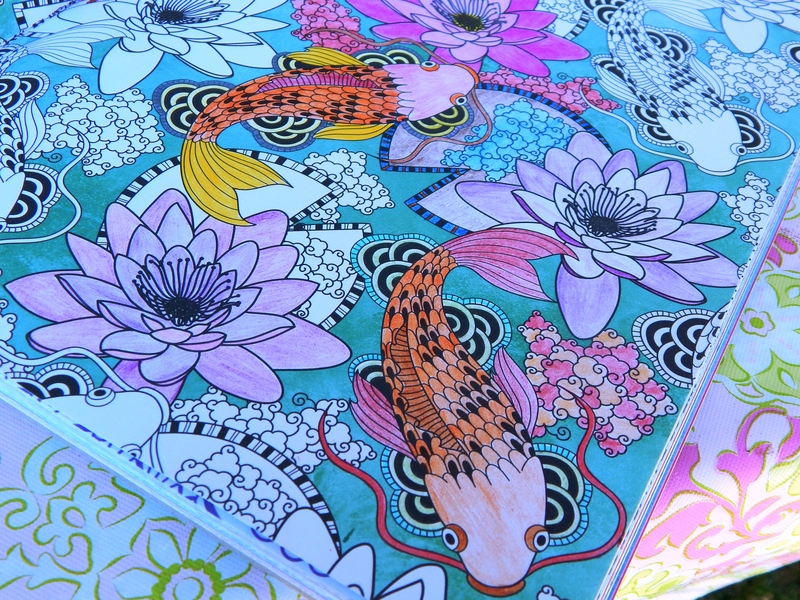 Right now I am working on a two page spread of Koi Fish. I have taken it to the beach in the evening. Feelings of wellbeing washed over me like the sound of waves in the background as I let my artistic inclinations run free. Sitting outdoors with my husband chatting casually with each other, I picked up the hardcover, sturdy book, and actually found I heard more of what was said in the conversation and my mind did not wander (aren’t we all guilty of this sometimes?). I have also been using it when I need to unwind or am in go, go, go mode, and it has helped my mind slow down and think more clearly. In conclusion, I love this trend! I am going to include it in the free giveaways I give my clients. 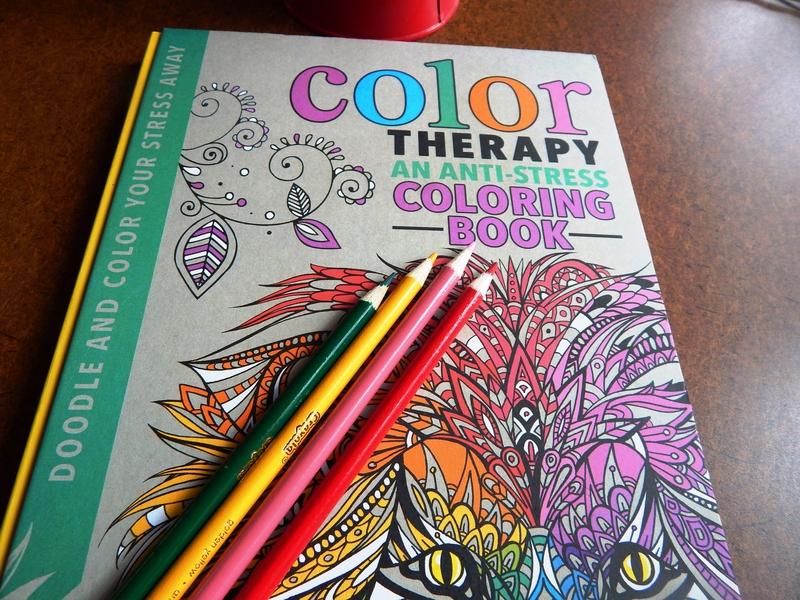 If you would like to try color therapy, you can find this popular new trend at a local bookstore or online. Here is the book I have been using, but there are plenty to choose from! Sign up for my monthy newsletter at my website above or a free initial consultation.